Home Blog HO! HO! HO! THE DECEMBER BREWHOUSE BURGER SPECIAL IS HERE! HO! HO! HO! THE DECEMBER BREWHOUSE BURGER SPECIAL IS HERE! Although this is not your traditional Christmas feast, once you try it, you will be wishing for more! Pulled turkey, melted brie, butter lettuce, and our house made cranberry aioli served on a milk bun. This burger is served with potato fries and includes a pint of our house brewed beer for just $25. 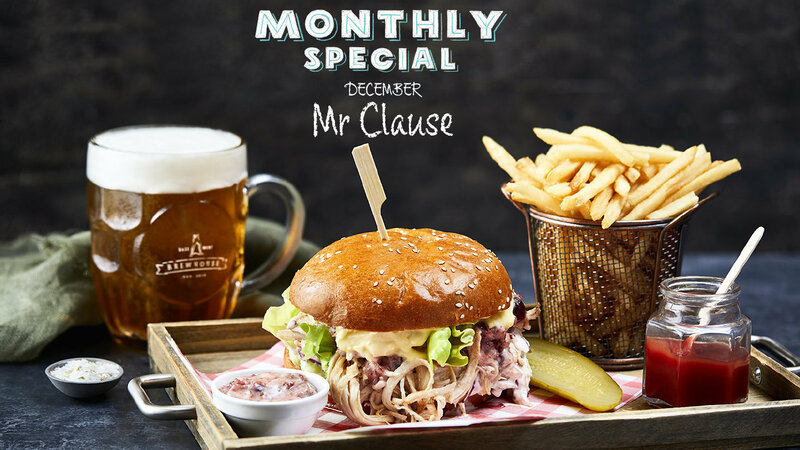 The Mr Claus burger is available now until 30 December 2017.